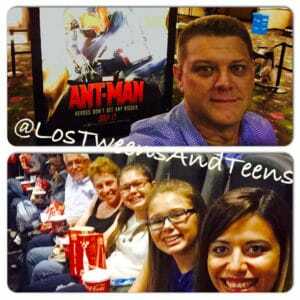 18 Fun Facts of the New Marvel Movie "Ant-Man"
[TOP] Dad, Chris, in the movie screening in Miami 7/15. [BOTTOM] Abuelo (Sergio), tia (Sara), twin teen girls (Sophia & Oliva) and tia (Anllelic) in New York City’s screening 7/16. We were invited to watch the screening of Marvel’s new movie, Ant-Man (in theaters July 17th), not in one city – but in two-Miami and NYC! And guess what? Dad, abuelo, tia & 2 teens ALL LOVED IT! It’s a great mix of super-hero, nerdy talk, a super-cutie-little-girl, family-drama, special effects, heart-pounding action and sprinkles of super-funny lines that keep you entertained throughout the entire movie. Oh! And the fact that you can see Michael Douglas perform along side the handsome super-hero Paul Rudd, is surely worth the movie ticket. 1. If you ever wondered how the Ant-Man suit works, here’s the answer. The suit encapsulates the Pym Particle technology that allows a person to shrink down to the size of an ant. When the wearer wants to change size, he uses a button on the suit that regulates the Pym Particles, which run through the suit and helmet like an intricate system of veins. The particles are volatile and change the distance between atoms, so the suit and helmet serve as protection for the wearer. 2. Costume designer Sammy Sheldon Differ and head suit designer Ivo Coveney, along with their talented team of artists, constructed 13 Ant-Man suits, 17 helmets, 17 belts, 8 pairs of gloves, 15 backpacks, 6 pairs of shoes, 15 balaclavas and 14 necklaces that go on the balaclava. 3. The Ant-Man suit is made of leather and resembles a vintage motorcycle suit. It has a worn look and is battle-scarred to harken back to when Hank Pym was AntMan and wore the suit on missions. 4. Each Ant-Man helmet has 54 different pieces to it as well as 10 LED lights. If you add in the nuts and bolts and the helmet lining, it’s over 60 individual components just for each helmet. 5. In each Ant-Man suit there are over 159 LED lights, which are controlled remotely. All the circuitry and batteries for the lights are in a very small backpack. The whole suit can light up, including the gloves and belt. 6. In the movie, the villain’s heavily armored Yellowjacket suit can withstand bullets and has articulating arms that can shoot plasma rays, plus it incorporates sensors and infrared vision. Like the Ant-Man suit, the Yellowjacket suit has the shrinking technology built in. 7. For the scaled-down Ant-Man sequences, the filmmakers used a combination of motion-picture macro photography, still macro photography, motion capture with the actors, motion capture with the stunt people, and for every set they built miniature sets, called macro sets. Macro photography is extreme close-up photography that produces photographs of small items larger than life-size. 8. In the spirit of shooting everything in miniature, the macro photography team built a mini clapperboard, the device filmmakers use to help synchronize picture and sound. Originally made of wood and handwritten on with chalk, clapperboards now have digital features, but the one for the macro sets was of the old-fashioned variety. 9. Marvel did a lot of research into ant behaviors and what the different species of ants could bring to the movie in terms of what filmmakers needed for the heist. For instance, the Paraponera clavata or bullet ants have a very painful sting and resemble dinosaurs in the movie; the Solenopsis or fire ants are like architects as they can link together and form bridges and rafts to help Ant-Man; and the male Camponotus carpenter ants can fly, providing Ant-Man with a helpful mode of transportation. 10. 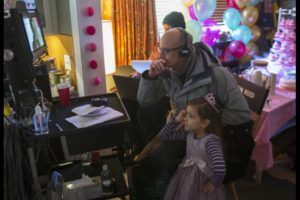 Director Peyton Reed also got into ant research and was helped out by his mother who sent him a book he had as a kid titled “World of Insects,” which featured an ant on the cover. Reed enjoyed catching up with his inner child as he leafed through the old book. 11. 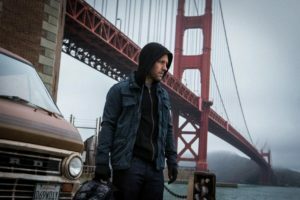 Marvel’s “Ant-Man” is set in San Francisco and many exterior shots were done there, including shots of the Golden Gate Bridge, the Tenderloin District and the exterior of a Victorian home used to portray Hank Pym’s house. Following San Francisco, the production settled into Pinewood Studios’ newly built facilities in Atlanta and Marvel’s “Ant-Man” became the very first movie to film there. The interiors of Hank Pym’s house where the first sets that the production design team constructed on the new soundstages. 12. 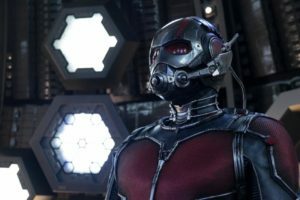 As with all the films in the Marvel Cinematic Universe, much detail went into creating Hank Pym’s old Victorian house set, from furniture, fireplaces, stained glass and even wallpaper. The wallpaper used in the Pym House set came from a store in New York City that specializes in classic, period wallpapers from the 1930s and 1940s. Because there are limited rolls of each design, the production design team had to plan carefully to ensure that there was enough available to do the rooms they wanted. 13. 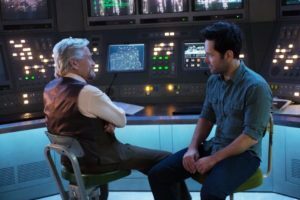 When you watch Marvel’s “Ant-Man,” look closely at some of the set dressing in Hank Pym’s house. You’ll see a little chair or a tiny weapon or other miniature everyday items. 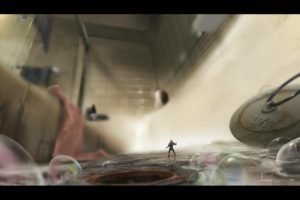 There are items placed all around the house that hint at the adventures Pym had when he was Ant-Man and suggest the experiments that he made shrinking inorganic objects before he made the breakthrough to shrinking organic objects. shelter and contains an old vault that secures the Ant-Man suit. 15. The Basement set is also home to a vertical ant farm that the production design team created. It actually houses live ants that went happily about their daily tasks oblivious to the filming around them. 16. In the film, Scott Lang (Paul Rudd) has a best friend Luis (Michael Peña) who owns an old brown van that has seen better days. The van keeps changing its appearance through the course of the story, and the different versions were dubbed the Mark 1, the Mark 2 and the Mark 3, in a tongue-in-cheek nod to the Iron Man suits. The Mark 1 is the old brown van that Luis is really proud of, but in reality it is a “beater.” The Mark 2 is accessorized for a job by the thieves and boasts things like bigger mirrors, so they can see who is coming and going, and side boards for fast ins and outs. The Mark 3 is geared up for the Pym Tech heist and is painted and accessorized to look like a Water & Power utility vehicle. precognition, but Reed drew himself as Ant-Man. This entry was posted in Entertainment, Mind, Movies. Bookmark the permalink.